For the uninitiated, it can be intimidating to look through faceting and/or jewelry-making catalogs and find a vast array of intriguing, but as yet incomprehensible items. Add to this the thought that some people can- and will- try to sell you a bill of goods you don't necessarily want or need, and many people cower instead of jumping in and checking on it. If you're wondering if faceting could be for you, and what it might take in terms of equipment, training, and time... this one's for you. Somehow, the mention of gemcutting often conjures up an image of someone examining a stone with intense scrutiny, then nervously approaching it with a hammer in one hand and a chisel in the other to tap that one blow to the stone that will start the creation of a masterpiece, or shatter the stone into fragments instantly. I love the drama and romance in all of that, but just have to say, that's not how it really happens here in the Facet Shoppe. Faceting, in general terms, means fashioning the surface of a gemstone in a design of small faces (or "facets"). Usually these are polished, but in some cuts certain facets are left "frosted" to create special effects. Typically, facets are flat surfaces, but some gemcutters create "fantasy cuts" by cutting grooves into the surface of the stone--as a merge of faceting and gem carving. Additionally, curved-facet machines are now available, and in time the curved-facet stones may become much more common. 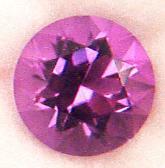 Another style of gemstone cutting produces a cabochon : a flat form or domed top (rounded) form. While this style of cutting is used on many gemstones that are often faceted, this is not a variety of faceting- cabochons have a continuous (usually curved) surface, not a surface consisting of many small faces. Most opal is cut this way. Colored Stone Faceting means cutting all of the "other" gems, except for cutting diamonds. Some of this info applies in diamond cutting, but cutting them takes more specialized equipment and training. Diamond cutting is covered in other parts of the web, as well as many books which may be available through your local library, and is beyond the scope of this topic. Of course, this is not intended to be an all-inclusive overview of the products, techniques, and safety considerations of faceting. This is for those who are curious about faceting and/or other areas of gemcutting- either desiring to just see something new, or for those who think they might want to give it a try. This is intended to offer a perspective of what you really need to get started, some things I think are valuable to consider before actually starting, and some sort of a roadmap for what you can expect to find most useful as you get involved in this truly rewarding activity. This can be one more step on a journey which could go in any number of directions- there is so much fun stuff to do and learn, we just have to pick what seems like the best idea at the time and go with it... the only limits will be in our own imagination or desires. That IS part of the glory in all of this... whatever captures your fancy as being what you want to create is the only real goal you need. Click on to return here. Intro to Faceting: "How to"
Some items below are Frequently Asked Questions; Faceting is easier to learn than you may think, so check it out! Most of this will be somewhat difficult to visualize without actually having a machine to practice on. It becomes very easy to understand when you have the equipment there, and can see how it works; new machines come with full instructions in sufficient detail for you to sit down and cut your first stone. But, would YOU want to get that machine? I am putting this here to offer an idea of what is involved in faceting so you can see if it appeals to you. You can read this section and then check out the definitions below (if you haven't already), or follow the links back and forth... This is intended for describing the general process; it is not intended to be a complete textbook or to imply this is the only information you will need. If any areas are not clear or if you want more information, e-mail me. 6 = Pavilion Main Facet   (crown/pavilion)"girdle" or "skill"facets. "standard round brilliant" stone from it. Many faceters will preform the rough stone into approximately the shape of the desired final piece. 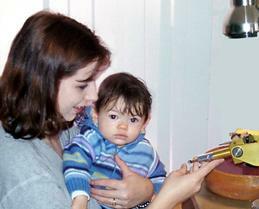 This can be done by hand before Dopping or can be done in the facet machine after dopping. Some will use their facet machine for this purpose, others use a different machine; others still will grind one side of the stone flat, dop the stone, and just start cutting. For the beginner, it is usually easier to visualize what you're accomplishing when faceting a preformed stone. Coarse grind/shaping: Put a coarse (260 - 360) lap on the machine, and cut the 8 main pavilion facets at the angle you have chosen for the material. This is usually 43 degrees for quartz (of which amethyst is the violet variety). Cut these all to the same height so they all come to a point at the center - the "culet". Then set the angle for 90 degrees, and cut 16 girdle facets to establish the size and outline of the stone. (On a 96 index, these will be 3 notches each way from the main settings, which were on intervals of 12. )For some people, this is how they start cutting a stone. Others may do this much twice: once with the 260, and once with a 600 lap. Fine grind/prepolish: Recut the above facets with the fine (1200 or 3000) lap and then cut in some girdle/break facets at the culet main angle plus 2 degrees (45 in this case)- these should have their corners meet at the girdle, meeting with the outside "tip" of the main facets. Polish: There are some comments about polishing laps and supplies below; any instruction manual or book on faceting will give you the info you need to get started. The main thing is to polish the facets that you have cut so far on the pavilion- this is where the repeatability of settings is so important. Course grind the crown: cut in 8 main facets at 42 degrees on the same settings you used on the pavilion mains. Be careful to not overcut the girdle. On larger stones, it may speed things along to set the angle to 0 and cut the Table facet to about half of the width of the stone; depends on the faceter. Polish the crown facets in this order: table, stars, mains, and girdle/break facets. Some like to polish the girdle at this point, also. The best part of all: remove the stone, and admire! ready for her to wear. 260, 600, 1200 (or 600 resin-bonded), and Polish Lap; 1 each. this will be all they ever use to cut a fabulous array of stones! For those who want to facet larger stones, a 180 (or even 100) lap will save a great deal of time and wear-and-tear on the other laps. Rough Gems by the truckload! This IS the stuff we're here for! A Trim Saw: a small rock saw, 4" to 6" blade- can be handy, but is not necessary... though some might want to debate that! THEN COME THE TYPICAL TANGENTS: Hm-m-m, nice stone- if I can do this well at faceting, wonder how I could do at cabochons? All these stones are so pretty, maybe I should learn to set them in jewelry... well, once that works out real nice, maybe I would like to make my own jewelry, because it looks really interesting to get some waxes, tools, a burnout oven and add on another room for the casting shop, right after that rockhounding trip into the Rockies... this can be quite an adventure, and it's hard to guess where it can lead to next! Many brands of facet machines are available, built to exacting standards for accurate gem cutting and reliability. Any machine made by a reputable manufacturer should be adequate to learn to facet on, though quality tools cost less in the long run: get the best that you can afford! Do some homework when purchasing equipment: it's far better to start with something you want to keep for a few years, than to "trade up" later. Remember that tools are only as accurate as the person using them; it is possible to make critical errors on the best of them! Some machines have "extras" which are nice- like a digital readout of the cutting angle- and may save time, but it will add to the cost. Perhaps the biggest difference between the machines is the placement of various controls- and who likes what setup is purely a matter of personal preference: there is no "best" machine... (seems to me that most people wind up feeling most comfortable with what they learned or spent the most time on). Every facet machine will have: a provision for setting the angle of the axis of the stone relative to the lap surface (usually accurate to 1/10 of a degree). Then, they will have a provision for rotating that stone around that axis: an "index wheel" is used for that purpose- it will rotate with the stone and have evenly spaced, numbered notches (96 is most common: one notch = 1/96th of a complete rotation.) so you can rotate the stone in precise and repeatable increments. (There is also another mechanism, called a "cheater" which will also rotate the stone around the axis in much finer adjustments- especially helpful when polishing.) Next, there will be a means of raising and lowering the above apparatus relative to the lap: this is either a mast or a platform... this is to accommodate the reality of getting the stone in contact with the lap at different angles. Also, to hold the stone to be cut in the proper position for cutting, a dop stick can be inserted and held in the machine, centered around the axis mentioned above, with the stone glued on the end that points away from the machine. Facet machines will have a provision for lubricating/cooling the lap: usually a water tank with a spout to drip water near the center of the lap. Most machines also have a lamp attached: this is a big help! Most of them have a variable speed control for the speed of lap rotation, and a switch to reverse the rotation direction (can be useful in polishing difficult materials). That is about it for the basics that are necessary. This will all make sense when you get to see a facet machine, trust me! As soon as I can, I will get some pictures to illustrate these things; it just isn't as complicated as it sounds! There are various "bells, buzzers, and whistles" that can be added to the above configuration, which have some value to those who use them, but are not absolutely necessary to successfully complete a faceted stone. These include: preformers (which shape the stone to the approximate shape of the desired finished product), various gauges for measuring cutting depth, some have lights which will indicate the point where the stone has cut to a desired angle, etc., and one manufacturer even has a setup to cut curved facets. If you really think you will want any of these features, you should consider getting a machine that either has them, or sells them as add-on accessories: it is easier and less frustrating than trying to modify a machine that they weren't designed for! One way to describe grit size (loosely) is particles per inch (through a screen mesh, technically)- it sometimes helps to remember this so you can remember the general relationship: the bigger the grit number, the smaller the particles. The smaller the particles, the closer to a polish. You can buy many commercial laps with the abrasives bonded to the lap surface, or make your own. Most commercial laps are high quality, incredibly flat, and well-balanced; if you really want to get to cutting, stick with these untill you have a reason to be making your own (and you may- it isn't really that difficult). Cleaning/Sharpening Laps is done to keep them cutting at a reasonable speed. There are many ideas out there on this one- I use a bar of Lava soap and a small hand brush (or green plastic scrub pad) to clean the laps when they start getting too much cutting swarf ground into them. There are "Sharpening Sticks" you can buy; use them sparingly, and they will help you get extra life from your laps. Dops look generally like a section of a round pencil, about 1/4 inch in diameter and 3 to 4 inches long, but made of brass or aluminum. On one end is where you will attach the stone to be cut, and the other end is inserted into the machine so that the center axis of the dop becomes aligned as the (vertical) center axis of the stone to be cut. There are differing means of attaching the dop within the machine, so dops are usually made for a specific brand of machine. For those cutting cabochons, a dop is just a section of dowel cut to the length most comfortable for the cutter. A Keyed dop is merely a dop which has some provision for positioning it in the machine in essentially the same alignment from which it was removed... this can be a handy feature for those who want to pre-form a few stones, and then finish them one at a time. Dops typically come with one of three ends: flat, cone (for the pavilion of round stones, looks like an ice-cream cone), and "V" (to hold the sides of a rectangle cut stone pavilion). Most machines come with an assortment of sizes, with one of each dop type in each size. common green dop waxes ..... melts at about 135 to 150 degrees. brown dop wax ..... melts at about 145 degrees. deep brown to "black" waxes ..... melts at up to 176 degrees. Note that once any of these waxes have melted, they continue to rise in temperature, and eventually do catch fire and burn. For most of us, this does unpleasant things to our fingers, clothes, and maybe wherever the drops land. Remember, we came here to facet stones, not start fires or practice bandaging our burned fingers! Also, this heat difference can matter (slightly) if you are cutting stones which generate a lot of heat, especially in polishing (i.e.- sapphires). Dipping them in cool water every few seconds helps assure they will remain in position: if they get too warm, they can move out of alignment or even come off of the dop stick. For polishing most stone varieties, this is not an issue. For your starter kit, a candle will do for heating stones for dopping, and removing them from the dop after they are finished. Candles can be a slight bother in terms of soot, especially on stone surfaces where you would rather have a good bond... but they are easy to find, will do the job, and are reasonably priced. At some point, an alcohol lamp (about $10) is a nice addition; they are a little cleaner to work with. In these, I use 99% Isopropyl alcohol for fuel. Notice all of the warnings on the label which mention "fire danger" and "Poison", among other things; It's not a big deal, just don't have the bottle open or too close when the lamp is lit, and don't drink this stuff! This alcohol also dissolves dop wax: put a few drops on a bit of cotton, and wipe the stone clean after faceting is completed- then sit and admire your handiwork for a while. The four sticks of brown dop wax that came with my machine lasted for literally hundreds of stones (it can be reused); to buy four more sticks- about $6. Some of the higher-temperature waxes sell for slightly more, and will last through a comparable amount of stones, stick for stick. Once you have cut and polished either the "top" (crown) or "bottom" of a stone, you have to attach the polished part of the stone to another dop so you can remove the original dop in order to cut and polish the rest of the stone. In order to keep the stone aligned with the cutting axis, a transfer block is used to hold the two dops in a straight line, with the stone in the center. Once both dops are attached to the stone along the axis, the "first" dop is removed. This is a relatively simple apparatus, and requires little explanation. Polishing Laps come in a multitude of materials, all of which have some use with different materials. Traditionally, they have the polish applied at the time of polishing, and do not come "pre-charged" (with the abrasive bonded to the lap). The Tin/Lead alloy will polish just about anything with either Alumina polish, Cerium Oxide polish, or 14,000 diamond. Many people favor a Tin lap for use with Alumina for most stones, and use Lucite (or Phenolic, a newer plastic) with Cerium for Beryl, Opal, and Quartz. There is a newer development of a lap that is resin-bonded with microscopic metal particles- (called the "fast lap", "last lap", etc.) which can be used with any polish and will usually deliver a great polish without scratching problems for most stones. Then, there are "ULTRALAPS", which have a uniform layer of polishing compound deposited on a thin polyester film disc. You can place this on top of your prepolish lap; it will be held in place by water tension while you polish and is easily removed when you are done. There are other "specialty" polish laps which you will encounter if you want to cut some of the less common stones (fragile, soft, or otherwise sensitive and not likely to be used in jewelry); these are made of substances such as wax, wood, leather, felt, pellon, vinyl (yes, old records! ), pitch, Prodigy CD's, and possibly anything else you can think of ... these are laps you can make, if they are not readily available. There are many sources of stones to cut: rock shows, gem dealers, mail-order dealers are listed in many magazines, internet sites (like this one), and a host of other possibilities. Most types of stones are available; the relative quality having much to do with the price. Some types of stones are harder to find; often this is because the country of origin protects their gemcutter's jobs by only allowing cut stones to be exported. This situation changes often; just keep looking. There are two general ways to buy stones: single stones and parcels (often called "lots"). With single stones, you get to pick a piece that is the size and shape that you want to cut, with a minimum of waste (at a relatively premium price). With parcels, you can buy a number of stones at a (usually) reduced rate with varying sizes and shapes... some will be "good cutters" and some will not. As you might guess, you have to decide what will work best for you. You can take a class if one is conveniently located near you; not really necessary if you want to learn as you go. There are some fine faceting books out there that each have enough information in them to teach you to facet and be a fine reference source for years to come. There are many books printed that are collections of faceting diagrams: books that give the settings and angles to cut various designs, for those who like to try new cuts. One of the great points about this hobby is that you can learn as much as you want without it being mandatory. Some people have a wonderful time faceting without giving a second thought to mineralogy or crystal structure; others want to know all about everything that influences the light path... suit yourself. You don't have to know all of that stuff to cut beautiful gems. And, of course, there are the computer-related faceting possibilities: Computer Aided Design and Raytracing of gem cuts. Count on your first stone taking 6 to 8 hours: this is where you learn where everything is, and what to do with it. After that, it will go faster- how fast us up to how much practice you get, and what you are cutting. An hour for a simple cut to 3-5 hours for complex cuts is what most people can reasonably expect. One of the good things about faceting is that you don't have to do the whole thing at once- you can spend only the time you want to. Unfortunately, to enter this hobby, it can be difficult to get started without purchasing the equipment up front. I like to look at it like paying for a large amount of entertainment in advance; after that, it can easily be self-supporting. The only way around this is to find a school, friend, rock club, or some arrangement where you can "try before you buy", and these situations are not that common. Used machines are an option to reduce the initial expense- sometimes a complete setup can be found for $500.00 to $1500.00 or more (depending on the initial price of the setup). Unfortunately, it is not easy machines to find used faceting machines for sale. A typical new setup is generally in the $2,000.00 to $3,000.00 range; depending on the machine and the laps purchased. For those who want all of the frills, the price can get considerably higher. Use this opportunity to check out our quality faceting rough or take advantage of our discount prices on our full line of quality lapidary equipment and supplies. a no-nonsense satisfaction guarantee, and excellent after-sale support. Comments or Questions? E-mail us Now! Page maintained by John Franke, facet@gemcutter.com. Copyright(c) 1997-2015.